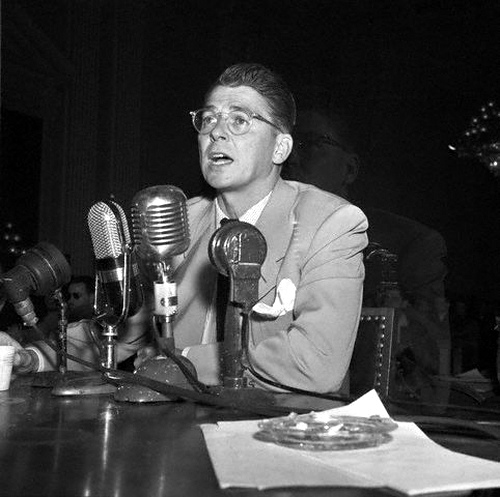 "Reagan never looked too closely at his audiences. Since childhood, he'd been frightfully nearsighted. His parents paid for thick eyeglasses, which he wore dutifully, but without them, his visible world was mostly blotches of color and drifting shapes. He had adapted without much questioning, the way that children can, forgoing baseball for football, a sport in which you didn't have to see well enough to hit a tiny ball, only well enough to hit another player. "When he spoke to large audiences, he didn't focus on the faces before him. Years later, after he'd become a national politician, his aides persuaded him to use a teleprompter. He'd always preferred cards, filled with his shorthand block writing. But he was not afraid to improve his performance, and he accepted the new technology. Just before going on stage, he would remove the contact lens from his right eye. From the corrected left eye, he read the words from the moving monitor. With his right eye, the one without the lens he looked at the crowd. He wanted to look at his audience, but he did not want too much detail. Seeing their faces was not important. "What mattered was knowing, feeling, just exactly what they wanted most. This was Reagan's great gift."